Most of the people in our group left on Saturday 2nd, only 6 of us stayed for the 10 year reunion, but in total we were about 42 participants. You can see some of them here. And more pictures from the reunion will hopefully be at this site. 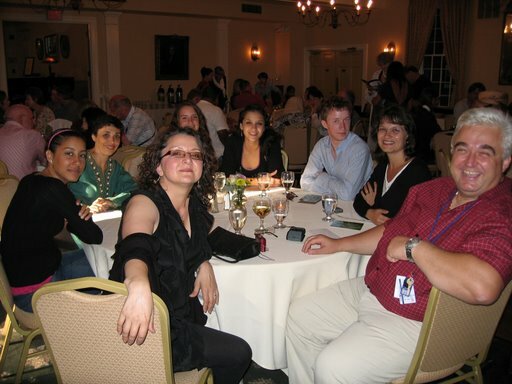 In this photo from left to right you see 5 of the 6 staying in the reunion from the group in 2008: Gaby, Aliaa, me, and then Alli, Abril and Owen (the three of them from ITD staff, most of the times the “dd” – designated driver); After them it is Pavlina and Athanasios. There were three lectures during the reunion, the first one by Bruce Laurie about American studies methods, the subtitle was “getting the isms through the specific”, that is, studying a small event that might be representative or generalised. He gave an example of how to research about many aspects such as: class formation, money and class, gender, and also learning to learn, through the study of a particular case, the case of Lizzie borden, the crime of the century. Then, on the second day Frank Couvares talked about the American elections in the States, from the past till now. I enjoyed it, partly because I have more background knowledge now and also he used a projector and the web for the first time in a lecture, what makes it easier to follow his explanation if you get lost in your own thoughts. By now, I understand everything Frank says, but, it is much easier when you see something written somewhere, because history has never been my strong subject. I used to take my laptop so that I could search for what he was talking about and got some more background understanding. This helped me a lot in the beginning. In the afternoon, David Stanley talked about the West, he seemed to have a pesimistic perception of what is going on there. Water is one of the main problem to face by the West. He also used the site National Atlas. On the third day, we had a session where the teachers from previous programs explain how their personal and professional life has been affected by their participation in the American Studies program. It was useful and enriching to hear all these experiences. The rest of the reunion were some visits and informal meetings and the final banquet. I have enjoyed it also, though 3 or 4 days was not much time to get to know everyone. Apart from me, in the reunion there were three more Spaniards, all women: María Belén Rozas from Asturias, Pilar Santos from Navarra and Lucia Magaldi from Andalucía (Córdoba). It has been very very nice meeting here and spending some time with them, I’m sure we will keep in touch. Then, almost everybody left yesterday, and I came to Boston for a few days. But that is a story for next post.